Rob gave me this fabric for Christmas. It was 3 yards and I used every last bit of it to make 2 dresses. 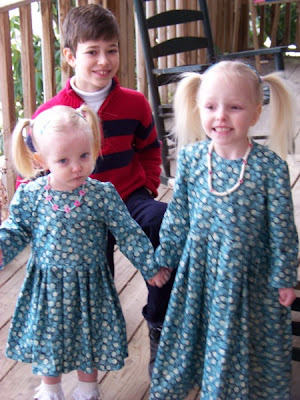 Both dresses have a zipper back and pleated skirts. This is not one of my "cheap" projects. I know we could have bought dresses cheaper in the store than the price of the fabric. 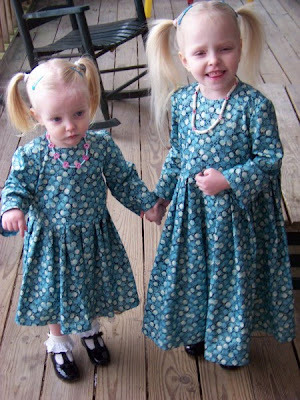 The dresses took a lot of time and fabric to make (set in sleeves and pleats made this a very time consuming project). I think the pleats look nicer than a gathered skirt making the time worth it. I think the fabric is pretty so the cost of the fabric was also worth it. You can't see in the pics but the fabric has gold in all the flowers. Here is a pic of all my children ready to go to church. Forgive the writing I still have my headache. Enjoying a fighting sport on-line is an effective way to chop unfastened and blow off a bit of steam. There are all kinds of on-line fighting games on the market, so it is just a matter of discovering one that appeals to you. It all relies upon what you are looking for.